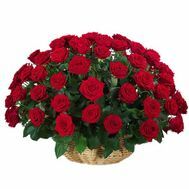 Rose baskets are one of the most beautiful gifts, suitable for a beloved girl who will appreciate all the romance of congratulation, and dear mom or grandmother, who will be delighted with graceful flowers. 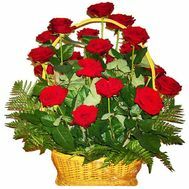 Even there is an opportunity to congratulate people living at a distance, because the delivery of flower baskets with roses all over Ukraine! This allows you to surprise your favorite people, even while on a business trip or a short business trip in another city. 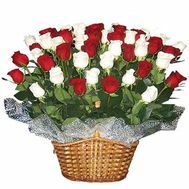 Variants of decoration of a flower gift can be very different: the baskets of roses can be unpretentious and elegantly decorated or, if desired, flowers can be laid out in a figure, for example, the heart. Such a confession of scarlet roses will never go unnoticed! 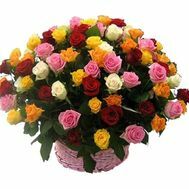 When ordering and subsequent delivery of flower baskets with roses, be sure to prompt the choice of color, which includes red flowers, pink, yellow and mixed. A single-colored bouquet or combinations of variants can be chosen individually, depending on the tastes of the gifted and the atmosphere of the holiday itself. 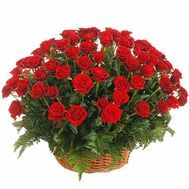 Possible delivery of baskets of roses, differing in size. The choice of a bouquet is extremely wide: you can fill a basket with 15 roses, and, perhaps, when choosing you will be much more impressed with a VIP basket of roses that has collected 200 colors of the same color or different, creating interesting transitions of shades. When choosing colors, it is worth remembering the existing alphabet. Red roses mean a deep sense of love and respect for the gifted. 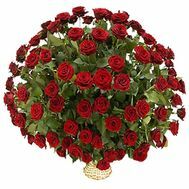 Bord roses are a classic option for first recognition, which is why they are very popular on Valentine's Day. 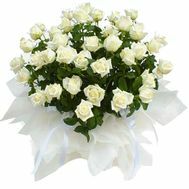 White roses represent purity and lightness, few weddings can do without these delicate flowers. 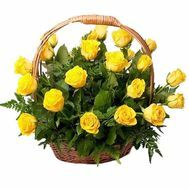 Gratitude on the anniversary will help to express baskets of yellow roses that look somewhat formal and solemn. Florists, professionals in their field, do not just create beautiful compositions. 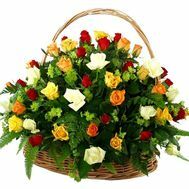 Flower baskets filled with roses can stand for a very long time, without losing their beauty, because flowers are used only the very first freshness, capable of pleasing the eye every day for an extended period. 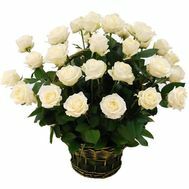 It is very difficult to find a more spectacular and amazing gift than a well-crafted basket of roses chosen especially for a bouquet. 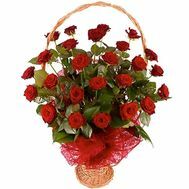 Rose baskets are an ideal option when you need a beautiful and original gift. They will be an ideal decoration for a birthday, anniversary, wedding or anniversary. The delicate, inimitable aroma that all roses have, will add a highlight to the holiday.